Home / 2013 in review – the year I became a better me! I cemented a life-style change of being fit and caring about my health, which I started in 2012, after more than a decade of being overweight. This was mostly accomplished through being conscientious about what I eat and exercising. My main exercise transformed me into a long-distance runner. One of my biggest accomplishments was to run my first race ever. 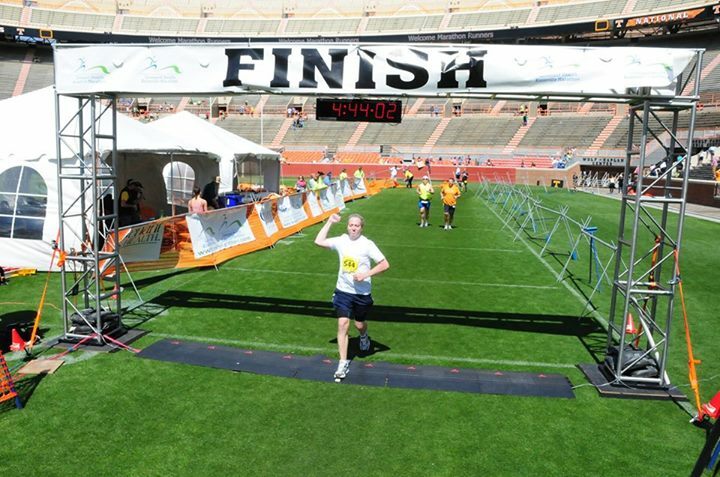 That race turned out to be the Knoxville Marathon on April 7th which I completed with a time of 04:42:00. I don’t know how many people can say their first race ever was a marathon, but it’s gratifying to be able to make that claim. After the marathon, I joined the KTC in May and have made many great friends since. Running in a social/group setting has become a staple of running for me and is now something that I always look forward to. Being in the company of my “runner friends” has motivated me and made me focus on becoming a good runner. I started running in most any race I could find. I ran one-milers, 5k’s, 8k’s, 10k’s, 15k’s, half-marathons, and even trail runs. I did pretty well overall, and did place in a few. I placed 3rd in my age group in the Run for the Deaf 5k, which happened to be my first ever 5k. At my first half-marathon, the Summer Solstice Half, I placed 2nd in my age group. 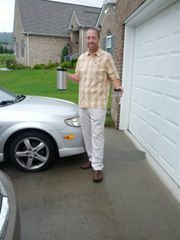 Along the way, I decided to go big again and participated in the Tour de Rocky Top Century Bike Ride. That was a serious 7+ hour grind for which running prepared me. It was the first time I had ridden in any official ride and the first time I had ridden more than 24 or so miles. Tour de Rocky Top celebration! All told between April and October, I competed in (14) runs and the (1) bike ride. That still seems staggering to me considering how inactive I was leading up to 2013. But, I wasn’t done. Late fall, and November in particular, marks marathon season and I had my eye on a few more events. Hi-ho, hi-ho Somehow, in the middle of it all, I changed jobs too! I went from being a remote software engineer, working 100% from home, to starting a gig with a local Knoxville company. Making the transition from remote to joining the rest of the world in the typical daily grind, and actually interacting with people face to face, was something I endeavored with enthusiasm (and lots of coffee). I registered for the NYC Marathon lottery and was accepted. I also registered for the Memphis marathon. By the middle of the year, this really was shaping up to be a story worth sharing with others. 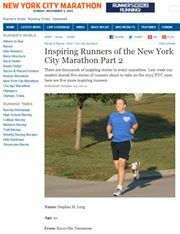 Subsequently, my wife, Marguerite, entered my name into a contest that Runner’s World magazine sponsored to be featured in a series of articles about NYC marathoners with inspiring stories. I was selected and was featured in their online magazine series. I still think “how cool is that?” To be a novice, first-year runner, and to be featured in one of the most prestigious, well-known runner resources is an incredible honor. Thanks to Runner’s World’s press release regarding their story, I was also featured on WATE6 (local ABC affiliate) and interviewed by Jillian Mayhen. The location for the interview was at Tom Black Track, which seemed appropriate to me since I did so many of my training runs there. Achieving some minor celebrity through my running and improvements really validated all of my efforts. Here I am chatting about the Knoxville marathon, weight-loss, and expressing some of my thoughts on the matter. After all the media excitement, it was time to head to New York. I was looking forward to the trip with my entire family. 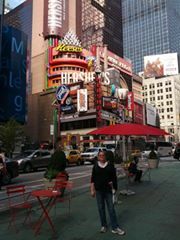 It was our first trip to NYC and our first “real” vacation in many years. 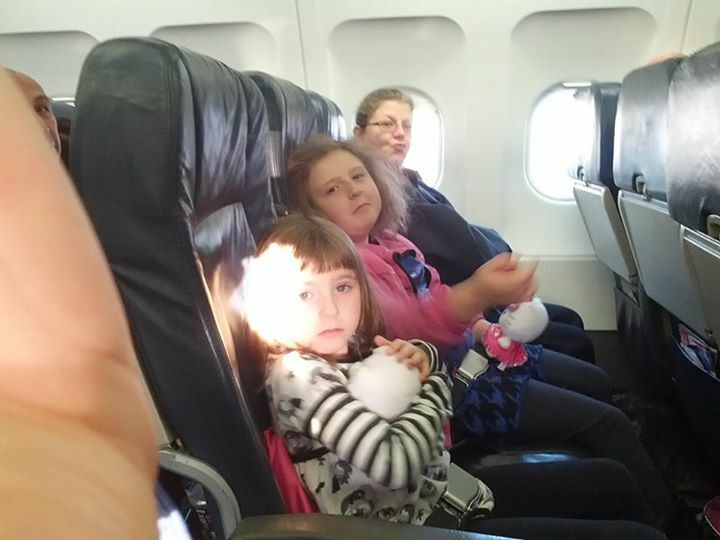 It was also the first time my daughters got to fly on a plane. Everyone was over-the-top excited. We had a very good time and enjoyed ourselves immensely. My only regret was that we didn’t have more time to spend there. Everything about the city and its people was inviting. Leading up to the NYC marathon, I was concerned about my physical condition because I had struggled with plenty of pain which affected my training. But, I pulled off a pretty decent run besting my Knoxville time by over 23 minutes (04:18:20). It was an incredible race with incredible spectators, energy, and support. I’ll never forget that experience! After New York, I set my sites on Memphis. We made the trek to Memphis in spite of the weather forecasts. There were people we needed to visit and wanted to see. I wanted to see my friends and family, and Marguerite’s grand-father had been ill. Rumors began to circulate that the marathon may be cancelled, but we took it in stride. Rumors became reality, though, and the Memphis marathon was cancelled due to weather. 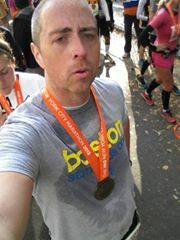 It was a big let down, as it prevented me from completing my 3rd marathon in such a short time-frame, and the weather hardly seemed bad enough to warrant a cancellation. I had also planned to run it with my long time friend, Michael Fountain. All in all, the cancellation was a huge let down and it took me a long time to shake off the disappointment and negative feelings. 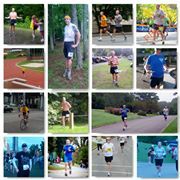 At the end of 2013, I had logged (18) official running races, (1) official bike race, and accumulated over 1550 milesrunning, and over 1850 milesfor all exercises. I also logged over 100 miles running for every month this year. This was a goal I set for myself once I started training for the Knoxville marathon, and was happy to be able to nail it. I have to say it was extremely hard to achieve that mark in December after having the Memphis marathon cancelled and hurting my foot. It really is the year I became a better me. I’m in the best shape of my life at 42, and, dare I say it, I’ve become somewhat of an athlete. Receiving the media attention, attaining tangible goals and successes, and having the support of my friends and family was transformational. Looking back on my past, as a chess-playing, life-long computer nerd, I didn’t really ever expect to take things this far. The only other time I garnered any sort of attention/success in any of my endeavors was way back in 1987 while in high school. Watching this year unfold, within the context of the past, has been incredible. What will 2014 unfold to reveal? I don’t know, but I also don’t intend to make any resolutions or plans. I’m still a “go with the flow” sort of person and will let the chips fall where they may. As for 2013, I’m not sure if I can top this incredible year!